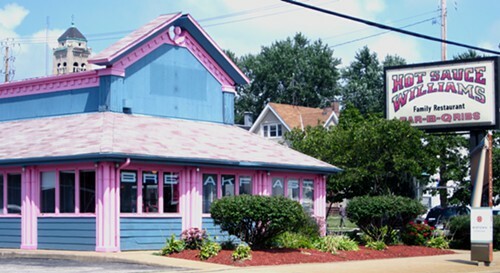 Edit: Hot Sauce Williams on Carnegie (pictured below) has closed, but the restaurant on Lee Road is still open. The restaurant on Superior is now called Hot Sauce Legacy Barbecue. Hot Sauce Williams is a Cleveland institution. I drive past it all the time and had heard so many good things about it that I finally decided I needed to try it. If you love fried food that is slathered in hot sauce, then this is your place. We went to the main restaurant on Carnegie, but they have additional locations on Lee Road and Superior Avenue. The restaurant has a “divey” feel to it, which I always enjoy (I still miss the old Suds Maguire in Olmsted Township). The tables are covered in plastic and the place looks somewhat run-down. Just don’t come here expecting fast or friendly service. In fact, the major negative about our visit to Hot Sauce Williams was that the service was slower than molasses and was not particularly friendly, but we quickly forgot about that after digging into the food. But if you go in knowing it’s a bit of a dive and that the food makes it worth the trip you’ll be ok. One thing I can say is that you get a massive amount of food for a great price. It just took an hour to get it. If you don’t want to wait that long, order whatever is in the warmers behind the counter. Hot Sauce Williams’ fried chicken was highly recommended as being amazingly good, so I went there intent on fried chicken. I ordered the 2 piece fried chicken breast dinner and received two massive bone-in chicken breasts. They needed to make it in the back and took their good old sweet time doing so. It came out so hot it melted the styrofoam. I could barely finish one breast and took the rest home. It came with cole slaw and French fries and slices of white or wheat bread and cost a whopping $5.99. 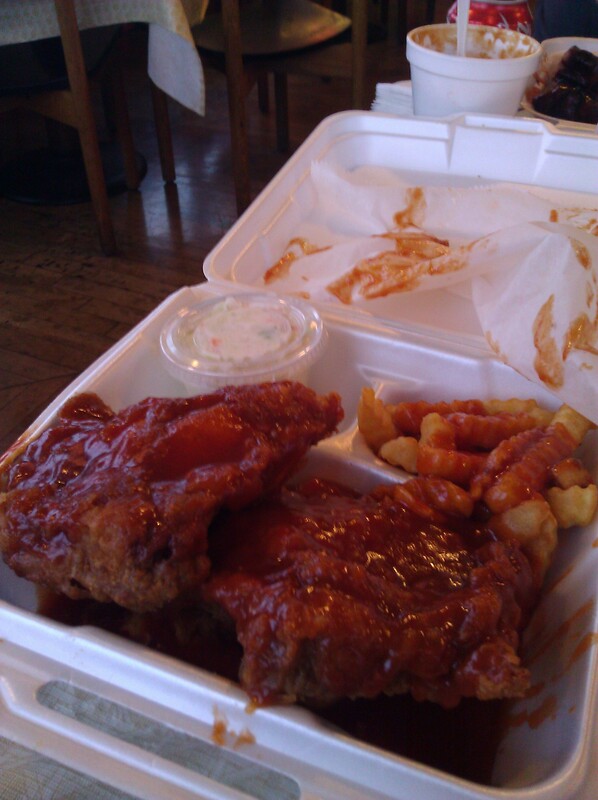 The wing dinner was $5.00 and also came with French fries and coleslaw, white or wheat bread. 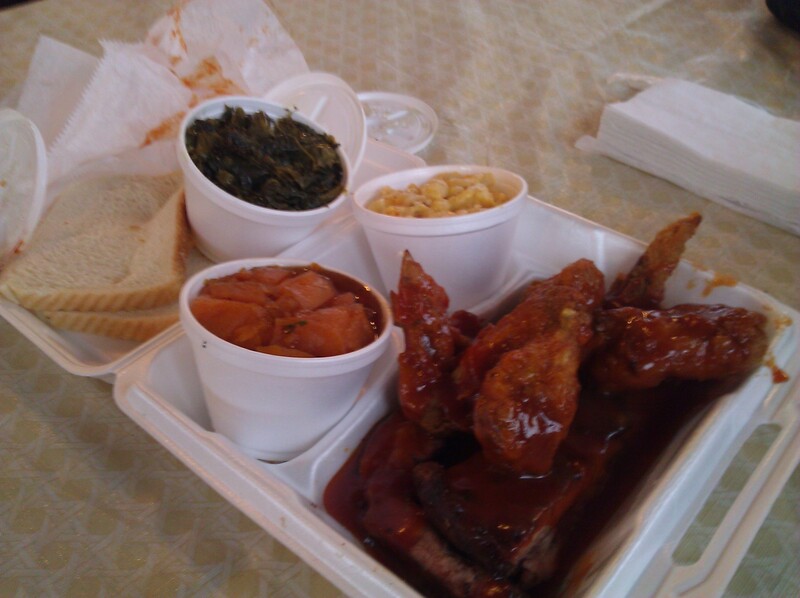 My friend upgraded and ordered three different sides, which she absolutely raved about – mac and cheese, collard greens and candied yams. True Southern comfort food! 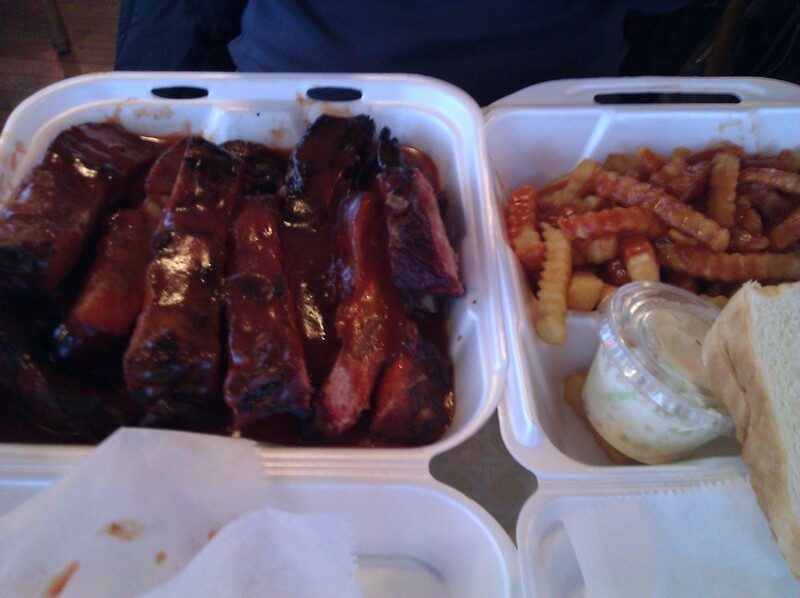 Another friend ordered a full slab rib dinner for $19.50 (it also comes with French fries, cole slaw and white or wheat bread). He let me try a couple bones while I waited for my food and watched everyone eat. They don’t fall off the bone, but they are nicely smoked and slathered in an absolutely delicious sauce. After all, Hot Sauce Williams is known for the BBQ sauce. They gave our group a mess of French fries for free to compensate for our wait. We got an industrial restaurant aluminum pan brimming full of fries (you can see it at the top of the photo in the center of the table). The fries are actually store-bought Ore-Ida brand fries, but they were good – especially drenched in the hot sauce, which wasn’t all that hot (as in spicy). We weren’t all that impressed with the desserts though (I was so unimpressed that I didn’t even take photos of it), so unless something really tickles your fancy just keep gorging yourself on the dinners. No one walked out of here hungry. 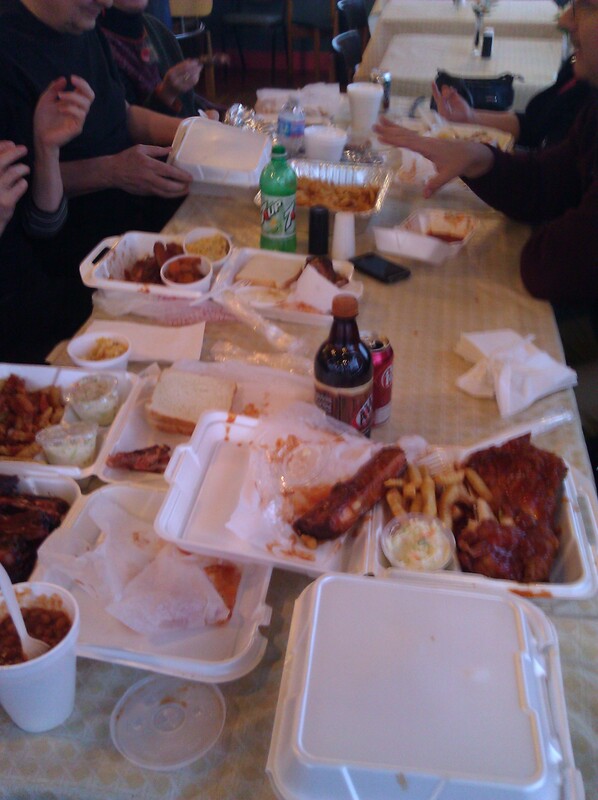 In fact, we all left with lots of leftovers. Hot Sauce Williams has been featured on Anthony Bourdain’s No Reservations and Man vs. Food. The menu item that was featured on Man vs. Food was the Polish Boy sandwich. It is a whopping $3.50. According to Man vs. Food, the Polish Boy is Cleveland’s signature menu item. I must not be a true Clevelander (although I was born in Parma and grew up in Olmsted Falls), because I have never had a Polish Boy. Pierogis? Yes. Kielbasa? Yes. But a Polish Boy? I had never heard of one until a few years ago. The Polish Boy at Hot Sauce Williams is made up of an all beef kielbasa, French fries, cole slaw, bbq pork shoulder, and hot sauce on a bun. I’ll be sure to get one next time. Previous Previous post: Chop It Salad Co.